Yeovil Hospital Charity is attempting to raise £2 million to build a dedicated Breast Cancer Unit at Yeovil Hospital, so part of our spring and summer activities at Brimsmore Gardens will be geared around fundraising for this much-needed resource. A prize draw opens for entry in April, and with prizes including £500 worth of vouchers for The Gardens Group, a night at Summer Lodge Country House and a hawk walk with Sharandys Birds of Prey, we expect to raise lots of money for this wonderful cause. 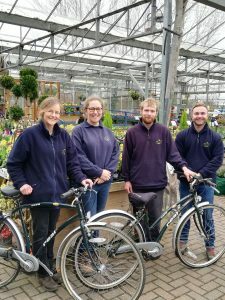 On Saturday 8 June, our team and representatives from Yeovil Hospital Charity will also embark on a static bike ride covering the 874 miles from Lands’ End to John o’ Groats. The journey is expected to take around three weeks, so please do come and cheer them on when you visit! Please visit our Just Giving page to donate and find out more.